The church stands in a prominent position overlooking Romney Marsh. From the entrance porch of the church, on a good day, Dungeness nuclear power station and the tower of Lydd Church can be seen in the distance across the fields and watercourses of Romney Marsh. From the back of the church there is a view across the Rother Levels: the white windmill at Woodchurch can be seen on the other side of the valley. The original church is believed to have been built in the 13th century on the site of a Roman Mithraic temple. Church Hill is clay-based and there is a high water table under the church suggesting underground springs despite the elevation. Adjoining the churchyard is Tilmenden Hall, the former vicarage. 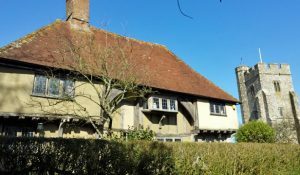 It is a distinguished 15th century timber-framed building with plaster infilling. On the first floor is a projecting oriel window and there is a ground floor window with its original wooden mullions. The church is open for visits every day. Like most ancient churches, it was built on an east-facing axis. The altar stands, slightly elevated, in front of the East Window. Facing east was associated with light and represented an orientation towards Jerusalem, the site of the Jewish temple and Christ’s death and resurrection. 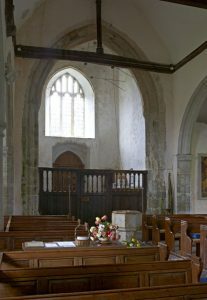 The photograph at the end of this section, which looks down the nave towards the West Door, was taken around the Longest Day. The building itself is mainly 15th century in the Perpendicular style: the church was largely rebuilt after a major fire in 1464. Within 100 years the church lost its stained glass, its ornamented walls, the shrines and statues, following the Reformation. It retains an interior that is relatively austere and plain, but with elegant proportions and a lightness caused partly by the whitewashed walls and clear glass windows. 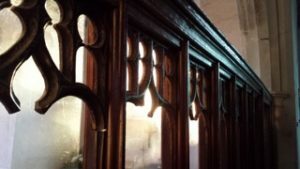 The pews and other furniture are largely Victorian and the interior changed little during the 20th or 21st centuries with no re-ordering. The effect is harmonious. Many visitors have commented upon the beauty and peacefulness of the church, which may be experienced by any visitor. “Possibly the most beautifully proportioned church in the south-east”. “What a lovely church we have stumbled upon, very peaceful”. Behind the wooden screen of 1705 is the Roman altar-stone which, according to local tradition, was dug up from underneath the North Chapel. This was the centre-piece of a Mithraic temple, which is associated with the sacrifice of bulls. 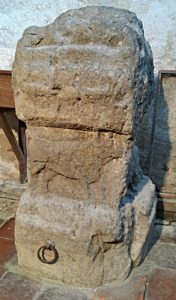 The Roman altar is a unique feature of the church, not duplicated anywhere else in the country. Yet the Church of St Mary the Virgin continues to stand over the Isle of Oxney. 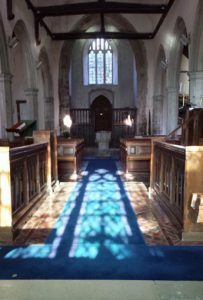 A fuller history of the church and its contents can be found in “Historical Notes on the Church of Stone-in-Oxney, Kent” which is reproduced on this website and can be accessed on the Church History page.